These buns are my jam! ok, I will stop now. I think I use that pun way more than I should. But I'm just cheesy like that. It's been a crazy couple of weeks in my house. My husband had been traveling for work and basically wasn't home for two weeks (minus weekends) and I've been slowly running out of steam. I have help from my parents, but after a long day at work, and a two hour commute, it's hard not to have your better half at home with you. Did I say better half? Don't tell him I said that, I'll never hear the end of it! But he's my partner in crime. Sometimes you gotta double team these kids if you want to win the night. So as I was going through the motions every night, I lost all energy for baking and this blog. I've only been doing this for about 6 months now, so not an enormous amount of time, but it's truly a commitment. I'm committed to coming up with something new every week, twice a week. And it can burn you out. I think this week has been it. I've been battered, browned and burned. It took all my energy to come up with something delicious. And that's saying something because I want something delicious, like, all the time! So after grinding my gears and asking my kids what they would want... they came up with cranberries. But Cake, cookie, what?! I decided to bake them into jammy buns scented with Orange zest. The flavors I've been thinking about are from Pannetone. And I'm not saying that this is pannetone, nope. But It reminds be of that zesty, citrusy, fruity soft bread. And well, that's just YUM. For the bread base, I used the same one I use for all my buns. It's adapted from the Woks of Life, who have the most amazing blog. I think I'm there blog groupie! But yes, those buns though. It's a fantastic recipe that quick easy and comes out soft and feathery every single time. I can't rave about it any more than I do. Whenever I make buns, my parents are waiting by the oven, fighting for the middle piece! 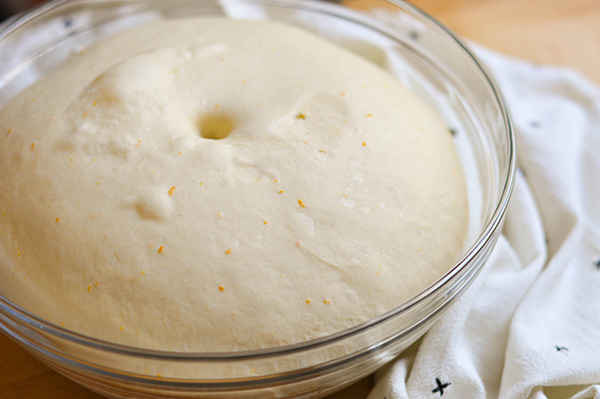 So once you get your dough going, add in your orange zest and knead it for 15 minutes. Then let it rise for an hour. Then it's time to fill. Warning: Do Not Overfill these buns! Use 1/2 tablespoon at the most, when I tried to put anymore, well... it became an utter mess! I have the pics to prove it. Take a ball and either roll it, or press it out into a disk, creating a bit of a well in the center. Spoon your cranberry jam into the center and then bring up the sides of the dough, slightly stretching them to meet in the center. Pinch it tightly to make sure the cranberries don't leak out. And try not to tough the cranberry sauce with the sides of the dough, as it will be come too wet and it will not pinch closed. So I divided my dough into 14 rolls, but busted 2 of them...so it turned out I had a perfect 12 rolls. 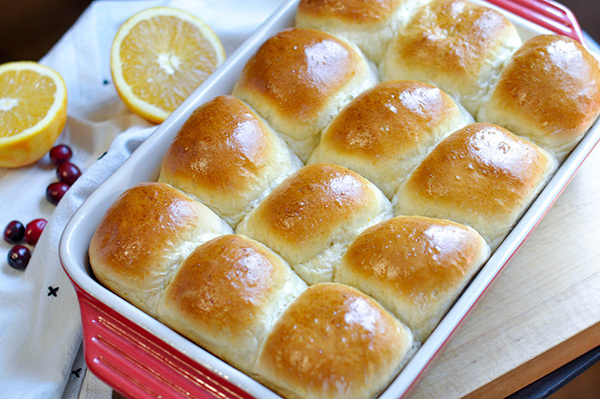 Allow these filled rolls to rise for 30-40 minutes then brush on the egg wash and bake for 25 minutes till golden brown. Allow to cool for a but, dust with powdered sugar and dig into these fluffy, bites of orange cranberry heaven! You can use your left over cranberry sauce for this, I think a whole cranberry sauce works better for this. It adds a nice texture to the filling. But if you don't have any, making your own cranberry sauce is easy and totally worth it! To make the cranberry sauce: Boil the water with sugar. Once boiling, add the bad of rinsed cranberries and bring it back to a boil, lower the heat and simmer for 10 minutes. I like to use the back of a wooden spoon to pop the cranberries while its simmering to help it along. Once it has thickened take it off the heat and allow to cool or chill in the fridge till you're ready to use it. To make the buns: mix the all the ingredients (cream through orange zest) in the bowl of a stand mixer fitted with a dough attachment. Mix till combined on a low speed, then increase to 2 to knead for 13-15 minutes. You will know its ready by using the windowpane test. Spread the dough apart with four fingers if the dough holds together and creates a window that is thin enough to see through, you're good to go. Place the dough in a large bowl, cover with plastic wrap and allow to proof for 1 hour. Once the dough has proofed, punch down the dough and turn it out onto your board. Divide into equal 12 pieces. Shape each piece into a smooth ball by pushing it though a circle created by your index finger and thumb. Cover with a cloth and allow them to rest for 15 minutes. Take each piece of dough and flatten it out, pressing the edges out and making an indent in the middle. Spoon about 1/2 tablespoon of cranberry sauce into the bun and carefully seal it up pulling the edges of the dough out and then pressing the opposite sides together. Careful do not to touch the sauce with the edges of the dough, because once it gets wet, the edges won't seal. Once tightly sealed. Turn the bun over and gently cup with your hands to shape it into a ball and place on your 13X9 baking dish. Do the same with the rest of the buns. Cover with plastic wrap and allow them to rise for another 30-40 minutes. Preheat the oven to 350F. Make the egg wash by whisking together one egg and 1 teaspoon of water. 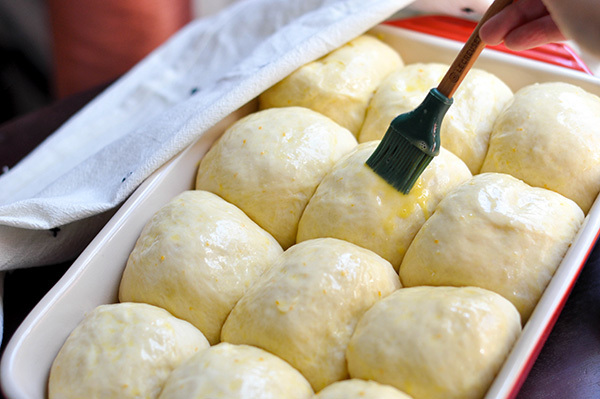 Brush the buns with the egg wash and bake for 25 minutes, or until golden brown. Allow to cool for 10 minutes and enjoy!